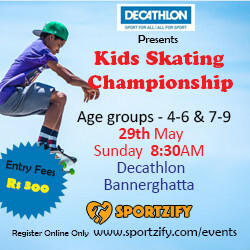 Decathlon Bannerghatta brings you again an amazing event for skating. This time its for kids. Get you skates on and compete with the other champions of Bangalore. Sportzify brings you a tournament where every kid gets a chance to showcase their skating skill. Category: Kids from 4 to 6 years and Kids from 7 to 9 years. "INCLINE SKATES(85mm & below) + QUAD SKATE "